This Coat of Arms Trinket Box measures approximately 4 inches in diameter, 2 inches tall. Made from cold cast resin with hand painted details, this diminutive box is the perfect size for holding that special token from your knight. This Gaming Dice Set of 6 is a great set to have for gaming. Why wait when you can have it all. Only one set is left. King Arthur pewter sculpture, from the King Arthur and his Knights of the Round Table set. The Knights of the Round Table pewter sculptures are 4 inches tall. King Arthur's Throne Pewter Sculpture, made to accompany the King Arthur pewter sculpture. This King Arthur Sculpture is made from cold cast resin with a hand applied bronze finish. Standing approximately 10 inches tall, Arthur holds his famed Excalibur and holy chalice. Made from cold cast resin with an antique bronze finish, this Lady of the Lake Statue measures approximately 9.5 inches tall. The ruler of Avalon from Arthurian legends, she is responsible for giving King Arthur his sword, Excalibur. Sir Lancelot pewter sculpture, from the King Arthur and his Knights of the Round Table set. The Knights of the Round Table pewter sculptures are 4 inches tall and accompanied by their chairs. Sir Galahad pewter sculpture, from the King Arthur and his Knights of the Round Table set. The Knights of the Round Table pewter sculptures are 4 inches tall and accompanied by their chairs. Sir Bedwere pewter sculpture, from the King Arthur and his Knights of the Round Table set. The Knights of the Round Table pewter sculptures are 4 inches tall and accompanied by their chairs. Sir Hector pewter sculpture, from the King Arthur and his Knights of the Round Table set. The Knights of the Round Table pewter sculptures are 4 inches tall and accompanied with their chairs. 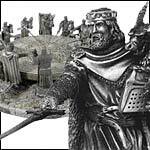 Sir Bohors pewter sculpture, from the King Arthur and his Knights of the Round Table set. The Knights of the Round Table pewter sculptures are 4 inches tall and accompanied by their chairs. Sir Gawaine pewter sculpture, from the King Arthur and his Knights of the Round Table set. The Knights of the Round Table pewter sculptures are 4 inches tall and accompanied with their chairs. Sir Kay pewter sculpture, from the King Arthur and his Knights of the Round Table set. The Knights of the Round Table pewter sculptures are 4 inches tall and accompanied by their chairs. This Medieval Shield Box measures 6 x 4 x 2 inches. Made from cold cast resin, it features fleur-de-lis and lions. Sir Sagremor pewter sculpture, from the King Arthur and his Knights of the Round Table set. The Knights of the Round Table pewter sculptures are 4 inches tall and accompanied by their chairs. Sir Tristan pewter sculpture, from the King Arthur and his Knights of the Round Table set. The Knights of the Round Table pewter sculptures are 4 inches tall and accompanied by their chairs. Sir Perceval pewter sculpture, from the King Arthur and his Knights of the Round Table set. The Knights of the Round Table pewter sculptures are 4 inches tall and accompanied by their chairs. Sir Urien pewter sculpture, from the King Arthur and his Knights of the Round Table set. The Knights of the Round Table pewter sculptures are 4 inches tall and accompanied by their chairs. Copyright © Medieval-Collectibles.com 1995-2019. All Rights Reserved.